Ever notice that when one friend gets pregnant, literally five others will be pregnant within the year? Well there's actually a scientific reason for it- not just your synced cycles. According to a 2014 American study, you're more likely to get pregnant when your bestie is- yes, pregnancy is literally contagious. Researchers, beginning in the mid-1990s, looked at data from 1720 women who participated in the study over a 10 year period. They looked specifically at groups of women who had been friends since high school and found that planned pregnancies does indeed spread like the plague among them. "Results show that, net of confounding effects, a friend’s childbearing increases an individual’s risk of becoming a parent," the research stated. But don't worry you're going to have five kids if your college bestie wants a big brood, researchers found that the boom affect lasts about two years. "We found this effect to be short-term and inverse U-shaped: an individual’s risk of childbearing starts increasing after a friend’s childbearing, reaches a peak around two years later, then decreases." There are several reasons why planned pregnancies are announced like dominos between friends. 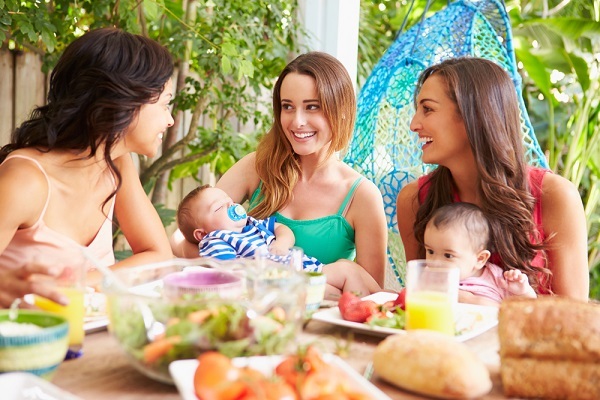 Firstly, fellow mum-friends provide support and information for parents-to-be; "a friend’s childbearing experience may be an important source of learning, because it provides relevant and useful information about how to face the transition to parenthood." Secondly, they note that we tend to compare ourselves to our friends, so their decisions to become parents can affect our own. Thirdly, if making the same life transitions as friends keep a group closer together as "synchronizing childbearing with friends may reduce the risk of being left behind by friends who already have a child." However, they continued to note that baby booms within friendship are only likely to happened with planned pregnancies, where friends are all at similar life stages. So if you want your best friend's kid to be friends with your little one don't worry! Science is backing you up! Pregnant? Get MummyPages' new updates via Messenger: mumy.me/preggers.